Ben is the CEO & Founder of Bow & Arrow, a global innovation consultancy. 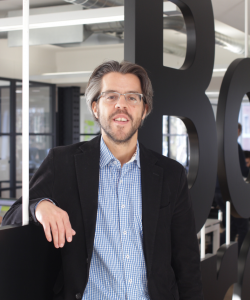 Bow & Arrow was started on the back of consistent feedback Ben heard from clients: that they needed a partner who could deliver both robust, commercially-led innovation strategy AND powerful, creative execution. Time and time again, CEOs and marketeers described how they’d had to work with both a management consultancy and then a separate design house to get actionable solutions for growth. Ultimately, they found their strategy was being developed without implementation in mind and the design was being conceived without the commercial imperative in place. As a result, their innovation process was unwieldy to manage and the outcomes were (inevitably) failing in market. B&A’s model of ‘strategy consultants who execute’ was built to solve this issue, by bridging both key disciplines, and partnering with clients through every step of the innovation journey to a fail-proof launch. Bow & Arrow have built a 35+ strong team that consists of ex-clients, strategy consultants and designers who work in close collaboration. They have won numerous awards for the business effectiveness of their work. (They don’t enter ‘creative’ awards). Since the company started in 2009, they have launched game-changing products, propositions and services for Google Adwords, Google Play, Google Politics, Google Education, Samsung, Dow Jones, The Times, The Guardian, Dixons Carphone, O2, PayPal, Spotify, BBC, GlaxoSmithKline, Mondelez, Kerry Foods, Premier Foods and McCain – working with many of these brands across the globe. Ben is most proud of the fact that every client who has hired B&A for a single project has re-hired the team almost instantly, with the majority working with them for years. (And when a client moves jobs, B&A is usually the first call they make when arriving at their new organisation). Ben regularly speaks and writes on the subject of how to innovate effectively.